Demodex are parasitic mites that cause a skin condition called mange, demodex, or demodicosis. These microscopic monsters can live in your cat’s hair follicles and oil glands, and on the surface of his skin. While all cats have a small population of these little pests (disgusting, I know), those who are sick or have a compromised immune system can’t suppress the mites from spreading, and so an infestation can occur. Demodicosis can be localized, affecting only specific areas of your cat’s body, or it can be generalized, affecting the whole body. When cats have a generalized infection, an underlying condition that suppresses the immune system is often the cause. Some common conditions that may suppress your pet’s immune system are feline leukemia, feline immunodeficiency virus (FIV), and diabetes. Feline leukemia and FIV are both contagious diseases, so your cat’s risk for secondary infections, such as demodicosis, becomes greater if one of these is present. With localized demodicosis, symptoms are usually mild and affect your cat’s head, neck, and ears. You will notice thinning hair, scaly skin, and the skin itself will appear reddish-brown and look very itchy. With generalized demodicosis, the symptoms are more widespread, also affecting the legs and body. 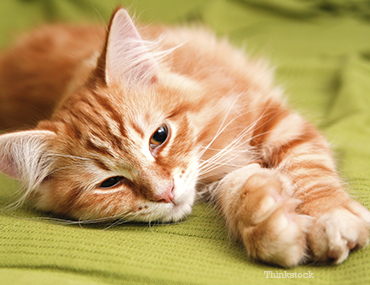 Your cat may look scruffy, show signs of hair loss, and seem very itchy. In order to diagnose your pet, your veterinarian will take skin scrapings of the affected areas and may recommend other tests specific to your cat’s symptoms and the severity of the infestation. They may include a test for feline leukemia and FIV. Both of these viruses are transmitted from cat to cat and, as previously mentioned, are highly contagious. The treatment for demodicosis will vary depending on the level of infection and your cat’s specific situation. Treatment typically includes specialized shampoos or dips. In some situations, additional medications such as antibiotics are prescribed, if a secondary bacterial infection has occured. For more information about the treatment of demodicosis, visit http://www.capcvet.org/recommendations/demodex.html. Maintaining your furry friend’s health is the best way to prevent him from acquiring demodicosis. A healthy environment, which includes keeping your cat strictly indoors and providing a good diet and regular veterinary checkups, will help him be in the best possible health! Although some forms of demodicosis may be contagious among cats, the good news is that demodicosis is an infrequent problem for cats and NOT contagious to humans!